NC State College of Veterinary Medicine graduate student Jessica Gilbertie is the winner of the 2018 Elaine and Bertram Klein Career Development Award from the Grayson-Jockey Club Research Foundation. The award provides a one-year salary supplement of $15,000 for promising equine medicine researchers. Gilbertie, cited for her study of platelet lysate therapy for infectious arthritis, is part of the Comparative Biomedical Sciences Graduate Program. 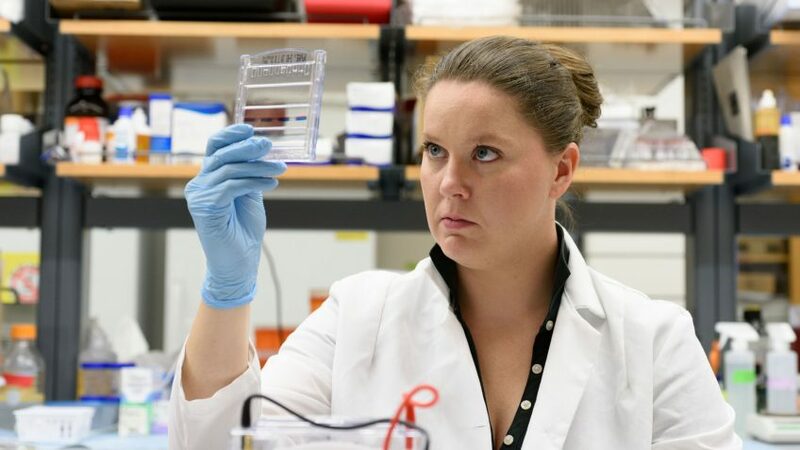 Since 2016, she has been a member of the lab of Lauren Schnabel, assistant professor of equine orthopedic surgery, and is researching antimicrobial properties of platelets for her Ph.D. thesis. In platelet lysate therapy, plasma-rich platelets are manipulated to rapidly release strong regenerative properties into the body, stimulating growth of damaged tissue. The therapy is also used in human medicine. Equine infectious arthritis is a life-threatening emergency. Gilbertie also recently received a two-year, $100,000 fellowship grant from the Morris Animal Foundation for her platelet lysate therapy research. For a closer look at the pioneering work of the Schnabel Lab, go here.